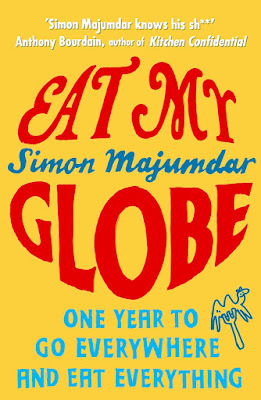 It’s that time of the year again and my turn to find somewhere suitable to treat HS to a slap-up birthday meal. Unfortunately, I couldn’t fob him off with a couple of pints and as much grilled meat as he could handle - he wanted to eat posh. When it comes to food, DH prefer the simple over the ornate. 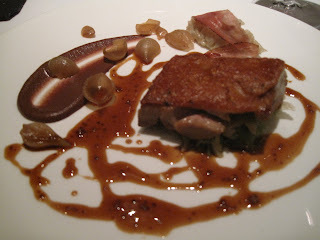 We like food to taste of itself and the many high-end meals we have experienced over the years have failed on this point. 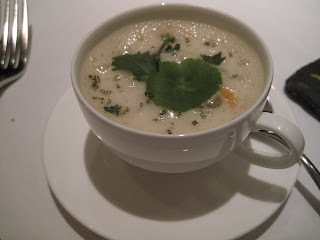 The tendency is to overwork the raw ingredient into a lukewarm lump of protein which tastes nothing like what it orta. 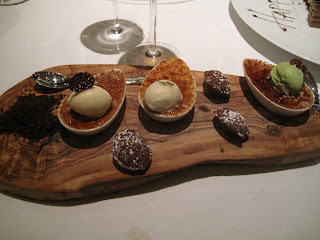 Fine if you’re young and easily impressed by the fripperies of fine dining but disappointing for oldies like us. 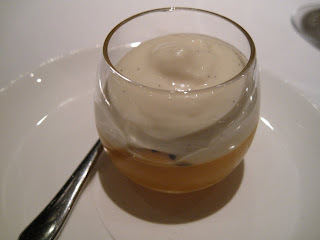 Still we’re nothing if not persistent and my suggestion of The Ledbury met with fraternal approval. 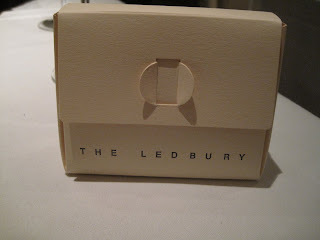 My first impression of the Ledbury was that it was a sort of halfway house for Aussies, such was the profusion of Antipodean folk in this attractive restaurant in London’s fashionable Notting Hill. In other words an agreeable place to get them integrated into normal society after years of pie floaters, bad beer and, of course, over-exposure to fireworks being let off the Sydney Harbour Bridge. 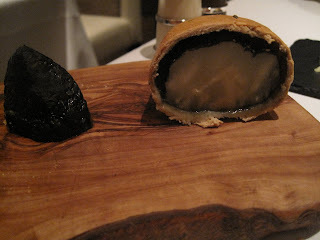 Misgivings about Australians and fine dining aside we had a terrific time at The Ledbury. The food hit some real highs that both had us as excited as, well, a couple of Hermanos in very excited mode. 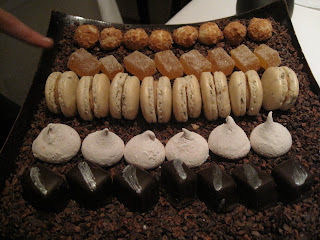 Being a serious sort of restaurant you do get lots of extras. 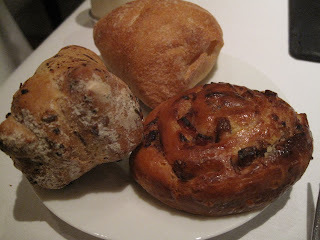 The best of these were the stunning warm Bacon and Onion Brioche which was light and savoury. They kept bringing ‘em – we kept eating ‘em. 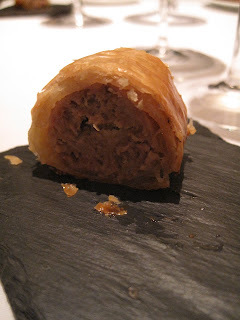 The other was a mini-sausage roll which was up there with the best we’ve tried. Definitely, one that could and should be rolled out into the main menu. 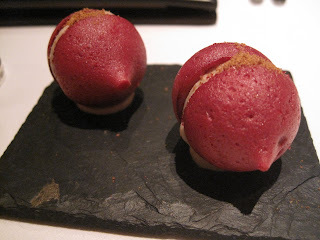 The little Beetroot Meringue filled with Foie Gras was ace as well. 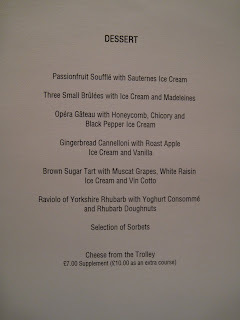 Sometimes the amuses can be the highlight of the meal but happily the standard was kept up for the starters. 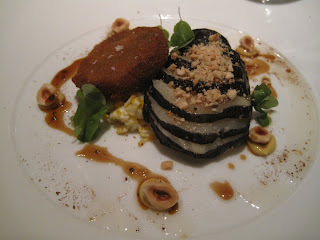 I enjoyed the little show and tell with the Baked Celeriac and the taste was a revelation. Vegetables will never seem the same again. 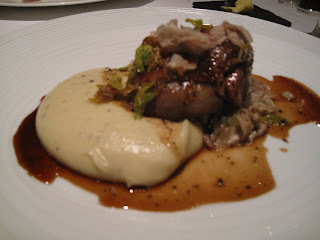 Equally as good was the Croqueta of Middle White Pork which HS insisted on sharing: it was his birthday meal – I had no choice. HS wasn’t so keen on his Lasagna which he described as a ‘bit solid’ but I liked the subtle flavours. 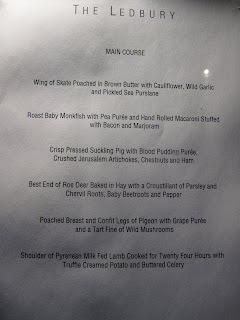 The real excitement came in the main courses. So excited in fact that our hands were shaking when we took our snaps – hence the cruddy pictures. 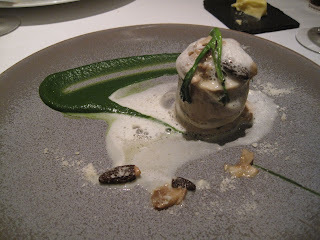 As regular readers of the blog will know we are in love with Spain and all things Spanish so it was natural that we went for dishes that were at heart very Iberian (although the ingredients were French). 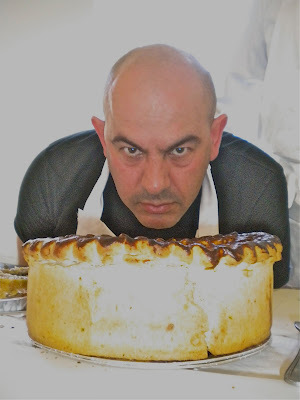 I was struggling at this point of the meal, owing to over-indulgence in bacon brioches, no doubt, so the sugar hit of an elaborate dessert was un peu de trop. Still polished it off though. 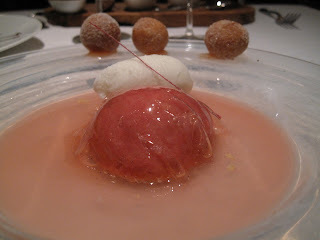 HS, however, enjoyed his new season Rhubarb-based dessert which looked a bit scary and other-worldly but disappeared just the same. 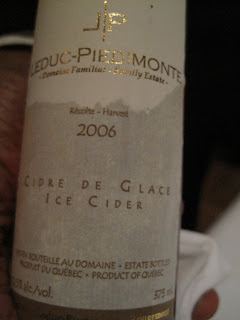 I was just happy quaffing the Ice Cider – a new one on me – which in a similar way to an Ice Wine can stand alone as a course in itself. PFs were out of the question but a custom PF carrier for the same was kindly provided. I’m guessing this happens a lot. 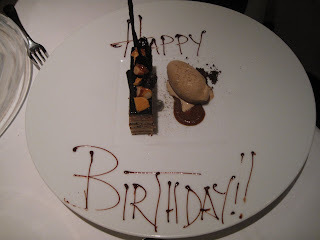 I think it’s true to say we, and more importantly, birthday boy, really enjoyed The Ledbury. It’s not overly formal, the service was friendly and professional. 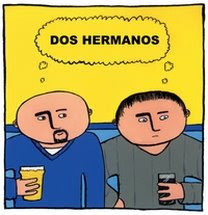 It’s an agreeable place to sit and eat food and, most importantly of all, they passed the Dos Hermanos Napkin Test™ with aplomb. Hey, it’s not much but it’s ours. I promise I've tried to answer this myself, but what's the napkin test? 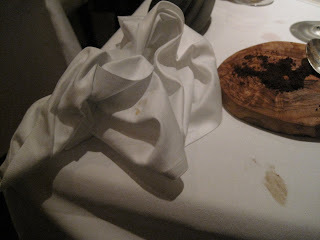 It's what the restaurant does with one's napkin when visting the bathroom. Points awarded are based on how the napkin is folded, where the napkin is placed, who carries out the operation, the timing etc. 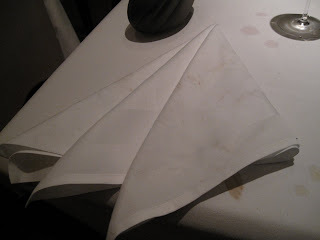 Eyre brothers failed miserably, they did not refold the napkin even after the captain had peered at it. They're in good company as Nahm failed in a similar fashion. 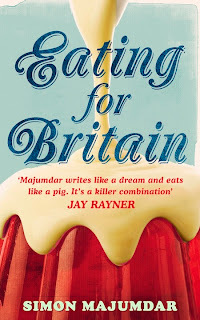 At the other end of the scale the late lamented High Holborn received very high marks for using a brand new folded napkin and placing it literally seconds before my dining companion returned exhibiting a certain degree of brinkmanship. I suspect some form of CCTV was in use. Needless to say it's nearly always done in US restaurants, even quite humble ones, although we haven't decided if putting the napkin on the back of the dining chair should gain or lose marks. 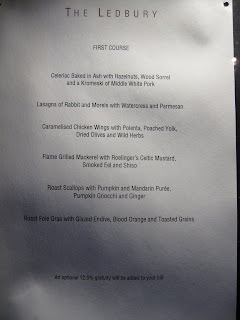 I thought HS got that Italian steak for his bday already.What's this dinner at the Ledbury(which I agree is infested with Aussies? From where it was possibly lifted from Ledoyen, Paris?